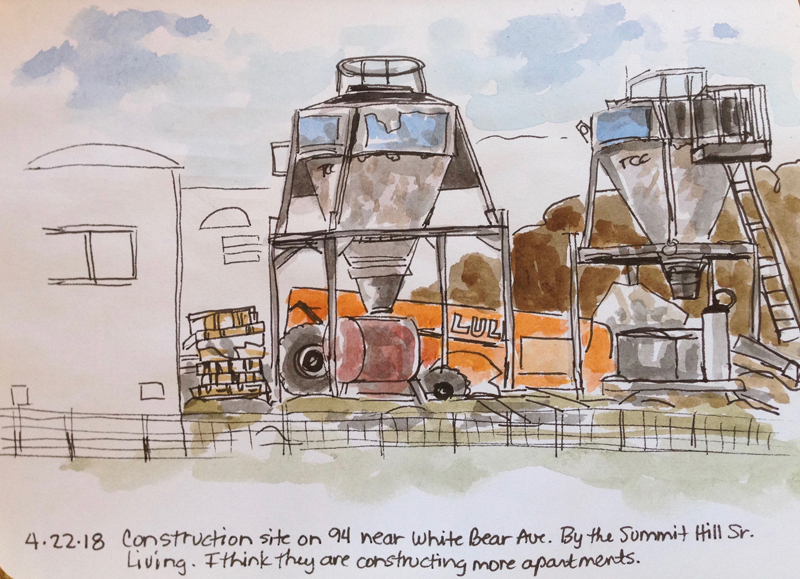 I had some time to kill before church, so drove to a construction site near the Summit Hill Sr. Living off of White Bear Avenue. I have seen the buildings going up and knew there would be some interesting machinery sitting around. The area was deserted, I had a spot in the parking lot to myself. I noticed these two conical shaped cement mixers (I think?). They were dirty and old and looked well-used. I also noticed the orange lift in the background, as well as some old brown stacked pallets in the foreground. All good ingredients for a quick sketch! The big pile of dirt in the background added to the atmosphere and beyond that, a ways away, was the freeway. Beyond the trailer, purple wrap on the structures of the buildings stood out to me. That will have to be a sketch for another day!